Corporate Jacket worn over the top on cooler environments. When sizing staff, we recommend fitting samples be used prior to ordering. 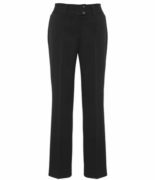 A trusted black or navy pant is a uniform essential that never goes out of style, but often the challenge is finding a great fit that suits a variety of body shapes. Our Perfect Pant helps overcome that challenge by offering three body fits in an everyday, classic style that will keep you looking professional – but more importantly, happy!